I first read Divergent (and the second book, Insurgent) almost a year ago, so I had already known that there was going to be a movie, and I spent a lot of time on IMDB while I was reading just to match up names with (the actors') faces. In fact, the thing that got me interested in reading Divergent was the fact that Shailene Woodley had JUST been announced as Hazel for The Fault in Our Stars (one of my dearest, most favorite books), and there were a lot of people online whining, "She gets to be in both TFIOS and Divergent????" Hearing the two books get mentioned together a lot, even for that sort of a comparison, made me really curious. So, I spent the summer tracking the Divergent tag on Tumblr and found all sorts of cool things about the movie, which was currently being filmed in Chicago, and I devoured all the interviews and panels from Comic Con, and I pretty much found myself obsessed with everything about Divergent, from the books, to the movie, to a certain THEO JAMES. I haven't been waiting as long as many fans for this movie to come out, but trust me, it still felt like a long time. And now, finally, here we are. Overall, I loved it. It wasn't as good as Catching Fire, but seriously, CF was ridiculously exceptional as an adaptation, so I think that it will be difficult to find any others (YAF) that are THAT well done. What do I look for in a book-to-movie adaptation, you ask? Well, a few things... I understand, of course, that novels and movies are two totally different forms of media, and that there will always be differences, and that you can't fit EVERYTHING from a book into a two-hour movie. You just can't. A lot of people still can't get over that. That's why it's called an adaptation. What matters to me is whether the changes they decided to make add to or detract from the experience of the story. But duh, right? That's what everyone is looking for. It's just that some people are better at accepting this idea than others. When I watch a movie version of a book I love, I take into consideration things that are acceptable losses and whether the things the writers/directors cut from the movie harm the story in any way, and I also keep an eye out for ways in which the movie improves upon the book. It rarely happens, but it is possible for a movie to be better than its source. I thought Divergent the movie did a good job of capturing the essence of the novel and bringing it to life, and certain things that I breezed by when reading were suddenly more impactful in visual form. There were some things that were noticeably missing, and though I lamented them a little bit, I did not feel that the overall story was harmed in any way, and the ending was JUST ambiguous enough to lead to a sequel, but still stood well on its own in wrapping up the plot for this installment. So here are some bits and bobs, things that stuck out to me as I watched the movie. - I'm so glad that the voiceover narration was used VERY sparingly, at the beginning to introduce the movie and at the very end. I hate teen girl voiceover narration. Even though Shailene Woodley has a great voice for it, and the lines weren't the least bit annoying, I just think it's so overdone. It wasn't bad here. - Holy casting, Batman! I've been seeing videos and photos for a while, of course, but seeing Shailene and Ansel (Elgort) interact with Tony Goldwyn and Ashley Judd... the resemblance was amazing between parents and children. - The scenes of all the initiates together from all the factions was pretty awesome to see. I love the costuming here, because there was a lot of individuality in the costumes, even though they were in the same colors to match their factions. - I can't watch any scenes with Caleb in them without getting REALLY angry. If you've read through the end of Insurgent, then you'll know why. (He's a TRAITORPANTS.) I liked how subtly schmoozy he was, saying hi to Janine at the Choosing Ceremony. - The aptitude test in the movie was just the dog part, and of course I would've liked to have seen it all as written in the book, but... acceptable loss. - I was really struck by the scene of the kids' last dinner with their parents, and how they ate with just the one light on and the rest of the room was dark. It really drove home the reality of their lives as Abnegation. - As a parent, I found the entire sequence at the Choosing Ceremony where the Priors react to their two kids leaving Abnegation just heartbreaking. The shock and the betrayal on their faces made me tear up ridiculously. - So, I don't know why, but when I read the book, the jumping-off-the-train part doesn't sound scary, but in the movie, when they are jumping onto the roof of Dauntless HQ, I found it TERRIFYING, and even though I know they are going to make it, I found myself clenching my fists. That was not a slow-moving train, and the roof was further from the platform than it had been in my mind. Holy god. That was scary. - Also scary was watching Tris jump off the roof into the huge, dark hole and then hit the net at the bottom. Mostly because of the sound of her hitting the net. - So, the big THEO reveal was still pretty breathtaking, even though I've seen the "Welcome to Dauntless" scene several times. So much of the dialogue scenes are shot in closeup rather than medium, and Four is a pretty major character in the story, so... yeah, we spend a lot of time IN THEO'S FACE, and for that, I just have to say, THANK YOU, FILMMAKERS. - Dauntless HQ was EVEN COOLER than I thought it would be, from the Pit to the bridge over the chasm (which was scarier and had less railing than I pictured). The little alcoves and stuff in the walls looked really cool. - I feel like they started with a lot more Dauntless initiates than they did in the book, but I suppose the point of that was to show how Tris worked her way up. - However, despite there being more initiates, we get to meet fewer of them. There is no Edward (well, there is one, but we don't ever meet him), therefore we do not get the butter-knife-in-the-eye scene, and there is no Uriah (well, there's a guy who fits Uriah's description and invites Tris to go ziplining, but no one calls him Uriah or anything), but we knew that already. Molly is barely a character - they made her big and tall, and a tough fighter, but I didn't get a particular sense that she was one of Peter's partners in crime. - Oh, Al :( Jumping ahead in the chronology a little bit, the scene where he's trying to apologize to Tris... it really was sad. I didn't feel particularly sorry for him in the book, but the guy who plays him really, really made me feel sorry for him. And of course, they did not give me enough time to process his death. Like, it happened, and then... MOVING ON. - The fight scenes looked brutal. I had a hard enough time reading the fight scene between Peter and Tris, but seeing it was that much more visceral. More on this later. - Jai Courtney as Eric = perfect blend of jackassy AND cruel. I would not want to mess with him, but at the same time, it was SO satisfying seeing Tris stand up to him. 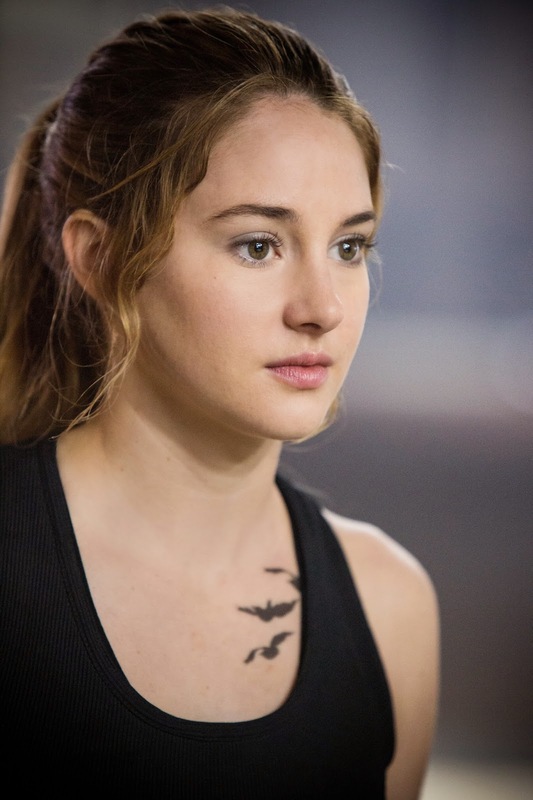 - The chemistry between Tris and Four was outstanding (because you know how I am about FEELS). It helps that Theo James is amazing in all his smoldery glory. But it was believable - I mean, I know it's fairly obvious who the romantic pairing is in the movie, but it was a good, slow build. - All the capture-the-flag/ferris wheel stuff was awesome, as expected, and the bullet-pain simulation bullets (I forgot what Eric called them) were so much more brutal than paintballs. The entire theatre applauded when Tris and Christina shot Peter. - The ziplining scene was EPICCCCCCC, and way scarier than I could've ever pictured it. Yeah, I am SO not Dauntless. - The fear landscape bits were interesting, and I think the most interesting part was Four coaching her to think of how a Dauntless would solve the problem. This part was kind of glossed over in the book, where Tris knows she can't reveal herself as a Divergent, but she still behaves Divergent-y when it comes time to go through her fear landscape. It's like, Thanks for giving us real answers, finally! - Four's fear landscape was as expected, though I'm a little sad that they didn't keep the fact that Tris helps him through each one. I thought that was a defining moment in their relationship in the book, because afterward, he's just in total awe of her. In this one, she's there, and she kinda helps, but Four doesn't look so scared to begin with? In the book, he was like, sweating and breathing hard and Tris really has to calm him down, but in the movie, he was pretty much collected. - Except when we get to the part with his father, and I SWEAR, there's a quick shot of Four looking at all the Marcuses, and he just looks like he's shrunken down to scared-little-kid status. KUDOS TO YOU, THEO JAMES. I don't know why but this part, the way he looked and acted, really impressed me. - PS - the guy who plays Marcus Eaton looks terrifying sometimes. Great casting. - Why haven't I talked about Kate Winslet yet? She is a goddess, as always. Even when she's evil. Also, I really need that Erudite coat she wears throughout the movie. That neckline is amaaaaazing. - So, the Tris-getting-ambushed scene was less terrifying than in the book, because she didn't get beat up so much, but it was still pretty hard to watch, because, again - girl getting beaten up by huge guys. I don't like it. - The ENDING ending, with Janine? TOTALLY not how it was written in the book. There was a shocking moment where the entire theatre GASPED, and I was like, "THAT'S NOT IN THE BOOK!" (You know how in the Four story, "Free Four," he talks about how knife throwing is just a useless trick they teach people in Dauntless to impress people? Well, let's just say... Tris found a use for it.) And the ending was the one thing I was iffy about, because it's so different, but in truth, the action made it more climactic than "We turned off the computers and ran away on the trains." So... I guess I can make peace with that. Holy god. Man, I am REALLY feeling my age right now, because even though I went to the 8pm showing, I feel as if I had gone to the midnight one. I may have more thoughts later, but I'm exhausted, and now I need to sleep. I apologize in advance for any typos or mistakes, and I'll edit them tomorrow when I'm more coherent.